This article guides you on how to extend the scan range to handle such scans. The ES360 3D scanner has a function called “Continuous Scan.” This function allows the user to initiate a second round of scanning immediately following the first round of data collection. The continuous scan feature ensures the next pass will be perfectly aligned with the previous pass, and so on. There are no limits to continuous scanning, so users can add as many rounds as needed to capture all the features and details of their oversized parts. The scan is incomplete due to the sculpture’s height being 1″ taller than the scan window. 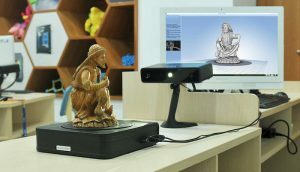 The ES360 continuous scan function allows you to digitally capture 3D objects by automatically aligning the multiple scan orientations. For example, say you’d like to scan a wood sculpture that measures approximately 8.5”x5”x5”. Because the scan window is 7.5” cubed, the sculpture is 1” too tall to be completely captured in one scan. To get a complete scan, three separate scans are required, as shown below. The ES360 continuous scan function automatically aligns the most current scan data with the previous scan. In this example, we needed to place the part in three different orientations to accurately capture the sculpture’s details and features. When we finish our third and final scan, the ES360 automatically creates our ready-to-use, well-aligned mesh. Note that each round produces more data, which can result in longer mesh processing time. 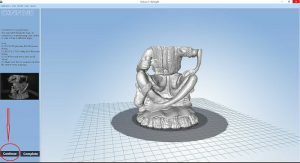 So be efficient with your scanning passes to create your 3D models competently and accurately! If you have questions about the ES360 Continuous Scan Technology, or how it allows you to scan objects from multiple angles to automatically align and merge the meshes to create an accurate 3D model, please contact us.